Scholarly Journals, Trade Journals and Popular Magazines: What are the Differences? 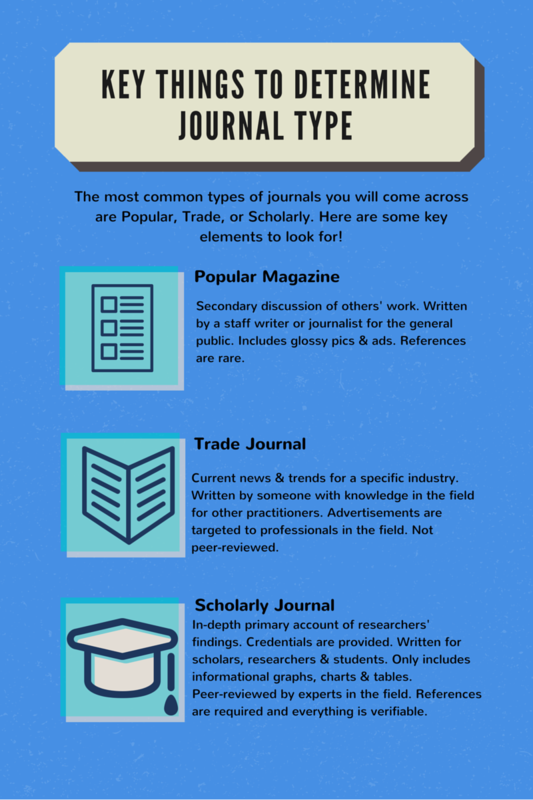 This guide will help you to understand the difference between scholarly, trade, and popular sources. Periodical is a term used to describe any publication that is published multiple times (periodically). Periodicals include materials such as popular magazines, scholarly journals, and newspapers. It is important to understand the difference between a popular and a scholarly periodical. When you are doing research, most of your sources should be scholarly. Often popular periodicals are called magazines and scholarly periodicals are called journals. Many times it will be acceptable to use some popular material, but research papers should not be based solely on popular literature. Here are some more detailed criteria to look for! Content Secondary discussion of someone else's research; may include personal narrative or opinion; general information, purpose is to entertain or inform. Current news, trends and products in a specific industry; practical information for professionals working in the field or industry. In-depth, primary account of original findings written by the researcher(s); very specific information, with the goal of scholarly communication. Author Author is frequently a journalist paid to write articles, may or may not have subject expertise. Author is usually a professional in the field, sometimes a journalist with subject expertise. Author's credentials are provided; usually a scholar or specialist with subject expertise. Audience General public; the interested non-specialist. Professionals in the field; the interested non-specialist. Scholars, researchers, and students. Language Vocabulary in general usage; easily understandable to most readers. Specialized terminology or jargon of the field, but not as technical as a scholarly journal. Specialized terminology or jargon of the field; requires expertise in subject area. Graphics Graphs, charts and tables; lots of glossy advertisements and photographs. Photographs; some graphics and charts; advertisements targeted to professionals in the field. Graphs, charts, and tables; very few advertisements and photographs. Layout & Organization Informal; may include non-standard formatting. May not present supporting evidence or a conclusion. Informal; articles organized like a journal or a newsletter. Evidence drawn from personal experience or common knowledge. Structured; includes the article abstract, goals and objectives, methodology, results (evidence), discussion, conclusion, and bibliography. Accountability Articles are evaluated by editorial staff, not experts in the field; edited for format and style. 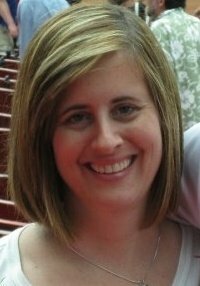 Articles are evaluated by editorial staff who may be experts in the field, not peer-reviewed*; edited for format and style. Articles are evaluated by peer-reviewers* or referees who are experts in the field; edited for content, format, and style. References Rare. Little, if any, information about source materials is given. Occasional brief bibliographies, but not required. Required. Quotes and facts are verifiable. Paging Each issue begins with page 1. Each issue generally begins with page 1. Page numbers are generally consecutive throughout the volume. The Burritt Library offers five options to ask for help with research form a librarian. Reference help is available by walk-in, phone, email, text, and web chat service. General information about borrowing policies at the Elihu Burritt Library. Check out our Course Reserves Guide for information on how to find and use course reserves at the Elihu Burritt Library. Use this link to search for ejournals by title or to browse the ejournal collection alphabetically. Check out our Interlibrary Loan Guide for information on how to create an ILLiad account to request articles and books from universities outside of the CSCU Consortium. Check out our library blog to see what's new in the library. Use this link to see our library hours in calendar view. In order to access databases and articles from off campus, you must be logged into your library account. View our Technical Support and Off Campus Access Guide for instructions on how to login to gain off campus access.